Dr. Wallenstein is board certified by the American Board of Obstetrics and Gynecology. She earned a bachelor of arts degree in biology with a neuroscience concentration from the University of Pennsylvania. She was then awarded her medical degree from Robert Wood Johnson Medical School, University of Medicine and Dentistry of New Jersey, where she was elected to the Alpha Omega Alpha Honor Society. She completed her residency in obstetrics and gynecology at Columbia University Medical Center, serving as chief resident. Her fellowship was in minimally invasive gynecologic surgery at North Shore University Hospital in Manhasset, NY. 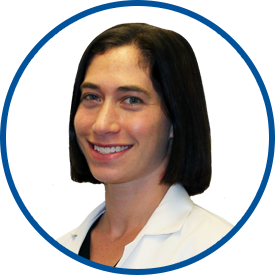 Most recently, she was an assistant professor and a full-time faculty physician in the Department of Obstetrics, Gynecology and Reproductive Services at the Mount Sinai Hospital’s Icahn School of Medicine. Dr. Wallenstein’s areas of clinical focus are routine obstetric and gynecologic care, contraception and family planning, minimally invasive gynecologic procedures, uterine fibroids and abnormal uterine bleeding. She is a Fellow of the American College of Obstetrics & Gynecology. Languages she speaks are English and Spanish. Excellent experience & great services. I love *Dr. Wallenstein - she is always helpful and courteous - I have recommended her to friends. awesome. perfect. feel so comfortable. Dr. Wallenstein is one of the best health care providers Westmed has. She takes the time to listen to my concerns and I always leave my appointment with peace of mind.